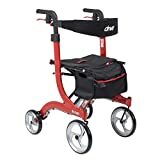 Today, more and more people are choosing wheeled walkers, or rollators, over traditional models which have no wheels, or only wheels in the front. 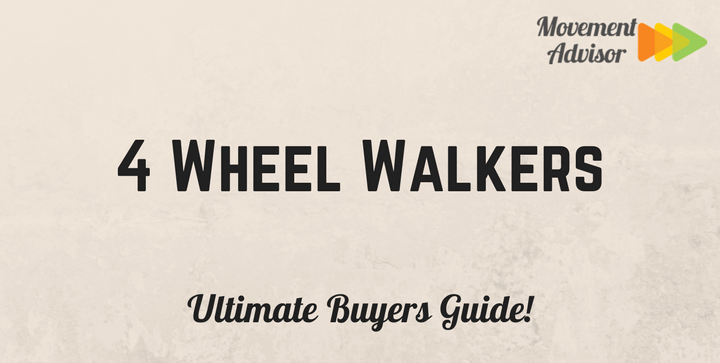 In this article, we’ll focus on the pros and cons of using 4-wheel walker, what you should consider before buying one and review some of the best 4 wheel rollators on the market. Several people choose 4 wheel walkers for their increased mobility over regular walkers, stability, and seat options. A 4-wheel walker helps you keep your balance without strenuous effort. You still have four legs to lean on, but the wheels allow you to move more quickly and smoothly than you could with a wheel-less walker. A 4-wheel walker is stable and durable. If you’re shopping for rollators, you’ve probably heard that there are 3 and 4-wheel varieties. Although 3 wheeled walkers are very flexible, they aren’t as stable as those with four wheels. You can also put more weight on 4 wheel walkers. The benefit of the 4-wheeled walker’s size is that it has the space to fit a seat. Some even have backrests. If you get tired while you’re out and about, having a seat on your walker will let you stop and take a break anywhere. All you need to do is lock your rollator’s brakes and sit comfortably. Some models let you fold up the backrest, so it’s easy to transport the walker. Even though you should take measurements before purchasing a rollator, to see what handle height is most comfortable for you, it’s convenient to have adjustment options. Four wheel rollators usually allow for a greater range of adjustments than smaller models like 3 wheeled rollators. The 4-wheeled walker isn’t the best choice for everyone. There are a few reasons why you might be better off using another type of walker. Wheeled walkers, in general, are meant for people who need help with balance, but not weight bearing. If you need to bear a significant amount of your weight onto a walker to get around, a traditional model might be better for you. Leaning too heavily on a wheeled walker might cause problems in control. Your weight might cause the rollator to move more quickly than you’d like. Whether you should use a wheeled walker has no connection to your body weight. In fact, bariatric walkers are intended for people who are overweight or obese. However, if you simply can’t support much of your own weight while walking, you should opt for a wheel-less walker. Even though a 4-wheeled walker can help you move more quickly, it doesn’t have a broad range of motion. People who want to make quick turns and maneuver in tight spaces will find that a smaller 3-wheel walker might be best for them. If a 4-wheel walker seems like the best choice for you, key points you need to consider are height, wheel size, seats, and storage. The height of your walker and its overall measurements are the most important aspect. Consider the dimensions of the product you choose to ensure you’ll be able to fit through the spaces you frequent. Make sure you know not just the product height, but the height of your handles. It’s also beneficial to have a walker with an adjustable height. Our height can vary slightly based on the shoes we’re wearing. You want to make sure you can hold your walker while keeping your wrists at a comfortable angle. Many people overlook the size of the wheels or opt for small wheels because they might seem natural. However, large wheels will serve you best. Small wheels can get stuck in cracks and have difficult on uneven ground or cobblestone. Look for wheels that are around 8 inches or larger to be able to cover most terrain without any trouble. You’ll also want to decide if you want a seat on your rollator. While some people have no need for a seat, others find it very convenient. Not every location has benches for you to take a break. If you suddenly find yourself worn out or experiencing severe joint pain, you’ll appreciate being able to stop anywhere and rest. Seats can also come with cushion or padding, which is ideal for people with hip problems. A backrest is another nice option that will keep your posture straight while you rest. Nearly all rollators today have some form of storage, whether it’s a basket, tray, pouch, or all three. Choose a model that has enough storage for your personal belonging. Baskets used to be the most common type of storage, but now people realize that they can be bulky and make foldable products harder to transport. Another option is to choose a rollator that has a removable basket or storage units. The Hugo Elite Rollator has a seat, backrest, and saddlebag. Its dimensions are 24.5 inches wide by 27.5 inches long. One advantage of this model is that both the handles and seat are adjustable. You can set your handle height anywhere between 29.5 to 38 inches. The seat ranges from 19.5 to 22 inches high. This rollator can hold up to 300 pounds. You don’t need any tools to assemble this rollator, and it folds up for easy transport. Large 8-inch wheels and hand brakes give you a safe experience. Additional features include its ergonomic hand grips and an additional storage bag under the seat. 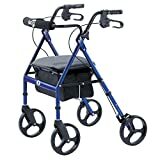 You can purchase this walker in blue and garnet red. Check here for price and availability. Drive Medical manufactures several rollator models. 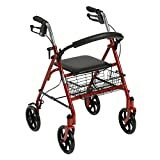 This one is the most popular and has several features standard to most Drive Medical 4 wheel walkers. It is foldable with a seat and back support. The frame of this rollator is made of steel, making for a durable product. Its width is 23.5 inches and its length 25.5 inches. You can adjust the handle height and its angle with a simple lever, from 31 to 37 inches high. It has a padded seat, which measures 12 by 12 inches. The backrest provides support, but you can also fold up or down. The wheel casters are 7.5 inches and have loop lock brakes. The rollator includes one basket for storage. You can get it in blue or red. Check here for the price and availability. Another strong choice from Hugo is its Portable Rollator. It features a seat, backrest, and 8-inch wheels. Underneath the seat, you’ll find a storage bag. 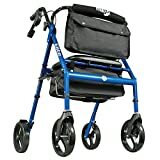 As its name suggests, this blue rollator is foldable and easy to fit into car trunks and closets when not in use. The set-up is tool free and includes ergonomic handles that are height adjustable. Its range is 32 to 38 inches high. The weight capacity of this model is 300 pounds. Its dimensions are 24.5 inches wide by 27 inches long. The Drive Medical Nitro has a unique look from its bright red color and “Euro Style” design. This walker has cross braces for greater stability and to allow folding. The Nitro is 23 inches wide and 27.75 inches long. You can adjust the handle height from 33.5 to 38.25 inches tall. The maximum weight capacity is 300 pounds. This rollator has exceptionally large wheels with 10-inch casters for stability and the ability to ride smoothly over various terrain. The casters use forks to increase the model’s turning radius. There is one zippered storage bag that is also removable. This red walker includes a seat with fold-up handles. The manufacturer even advertises this product as so easy to fold that you can fold it up with one hand. 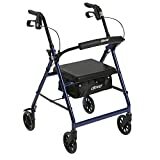 The Drive Medical can be difficult to differentiate from the first model listed, but the major difference is that this rollator uses an aluminum frame. It has all of the standard features of a Drive Medical rollator, including a padded seat, removable backrest, and loop lock brakes. The brakes have unique serrated edges, which allow them to get a firm grip. The black tires are 7.5 inches, with 8-inch casters, and non-marring, making them useable for indoor use as well. This aluminum rollator has a weight capacity of 300 pounds. You can adjust the handle height from 33 to 38 inches high. This fold-up walker has ergonomic handles and comes in dark blue and red.